Fear, uncertainty, and doubt (FUD) has been a classic combat technique used in all spheres of life. Quoting Wikipedia, "Fear, uncertainty, and doubt (FUD) is a tactic of rhetoric used in sales, marketing and public relations. FUD is generally a strategic attempt to influence public perception by disseminating negative (and vague) information." Reminds me of a childhood story of a few people using the same techniques to make a poor unsuspecting guy to part with his treasured lamb. 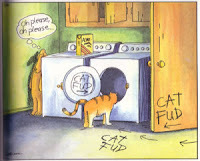 The cartoon (by Gary Larson) is funny. It somehow seemed to have a deeper different meaning in the context with which I am writing.